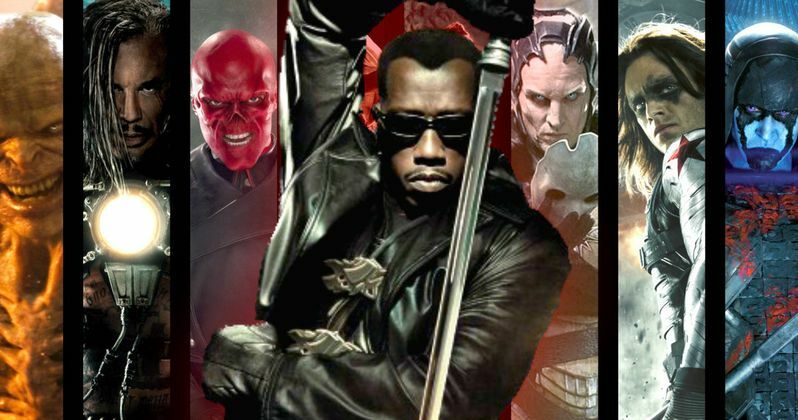 Is Blade the vampire hunter set to join the Marvel Cinematic Universe? Not that we can expect to see a reboot in the near future, but don't be surprised if the character shows up in the MCU at some point soon. Marvel Studios' head honcho Kevin Feige is in charge and, if he has his way, it will happen someday. Unless someone else gets his job, he more or less will get his way, so this is pretty good news for Blade fans. Kevin Feige has been making the press rounds for Spider-Man: Homecoming and took some time to chat with JoBlo. During the conversation, the subject of Blade 4 came up and the possibility of the character having a future in the MCU. Kevin Feige's answer was very positive, saying that the folks in charge think it would be cool, but the time isn't right just yet. Here's what he had to say about it. "We think it would be cool. Someday. My tenure at Marvel started 17 years ago, and there were two things that sort of launched the modern era. One was X-Men, which was the first thing that people said, 'Oh, there's life here.' But a few years before that, there was Blade. A character nobody had heard of at all, had only appeared in a few issues of Tomb of Dracula or something, turned into a big franchise. That was always a great lesson for me, where you go, 'It doesn't matter how well known the character is, it matters how cool the movie is.' Which, many years later, would be the reason we do Guardians of the Galaxy, Doctor Strange. I think Blade is a legacy character now, and I think it would be fun to do something with him one day." We have heard whispers of plans for Blade within the MCU. Last year, Wesley Snipes, who played the character in the original trilogy of movies, has been very on board reviving the character and said that the ball is "in Marvel's court." There were rumors that Netflix was possibly looking at doing a Blade TV series, but that doesn't seem to be in the cards now. Also, Marvel Studios isn't currently in the R-rated adaptation game, and that is what Blade would need to be, but Kevin Feige hasn't totally ruled it out in the future. The original Blade, starring Wesley Snipes, came out in 1998 and did relatively well at the box office, bringing in $131 million worldwide. That was good enough to spawn two sequels, with the Guillermo Del Toro-directed Blade II doing the best both critically and financially, making $155 million. Blade: Trinity was seen as a mess all the way around and did the worst financially, bringing in $128 million. In total, the movies made $415 working from relatively low production budgets. Those aren't huge numbers by today's stands, but with the power Marvel Studios has now, Blade could be a monster property. When the time is right, Marvel fans. Wesley Snipes Still Open to Blade 4, But Is Marvel?